"Though small in size, exploring morocco; discovering ourselves merits coffee table status that offers something new each time it's opened. Each page delights every sense through gorgeous photographs and inspiring questions. Truly a wonderful gift for yourself and for anyone who appreciates exotic travel and creative self-reflection." 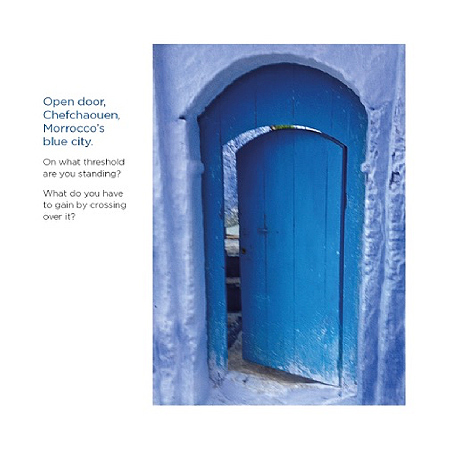 exploring morocco; discovering ourselves is perfect for igniting the senses, thinking and feeling deeply, and giving to your most daring colleagues and friends. 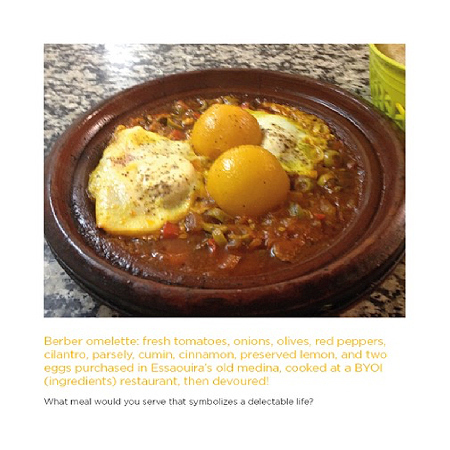 Photographs of Morocco's splendors, each accompanied by a self-reflection question, inspire readers to delve into this life-mirroring land and themselves, expanding what it means to live fully, personally and professionally, inside and out. Spending time meditating or reflecting on a photo, a question or a combination of the two, converts our overly protective, defensive stress state—in which many of us find ourselves too much of the time—into a state of restorative, receptive contemplation. This matters. In a parasympathetic, versus stressful state, more blood flows to our higher brain centers, allowing us to more clearly analyze information, connect with others, experience empathy and think critically and creatively. 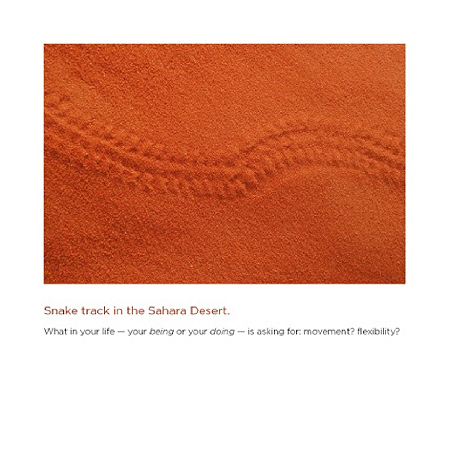 How do rose colored grains of Saharan sand and a snake track running through them elicit energy and/or clarity around a decision that an individual or a business has to make? What does a room filled with handcrafted tin and multicolored glass lamps reveal about one's own unique light or purpose? How does the towering, vertical-walled Dades Gorge inspire one to express their own magnificence? For some, exploring one's life and its possibilities through photos may seem, at first, too out there. Others may view it as an exciting jumping off place from which to delve into their lives, beliefs, values, desires, relationships, goals and challenges, both personal and professional. The invitation stands. Each photo and question is an open-ended (and fun!) opportunity to expand the aperture of what is possible, inside and out. Who knows what can be discovered, created and solved! "The power and potential of microfinance is best understood by those who have spent time with poor and formerly poor women who are using microfinance to break the generational cycle of poverty. The next best thing to meeting these women is to read Dana Whitaker's book. It inspires and informs, appealing to the heart and mind as it opens up both." Around the globe, three billion people, or half of us, barely subsist on $2 a day. Of those, 1.2 billion people, or one in five of us, struggle to stay alive on less than $1 every day. An unconscionable 23,000 children under age five die every single day of largely preventable diseases and malnutrition. One hundred million children of primary school age cannot attend school because their families lack the necessary funds. Though the task of eradicating poverty may seem hopeless, it is women in villages and urban centers, mothers and grandmothers, married and divorced, educated and illiterate, healthy and disabled, who are proving that there is a way outwith the help of microfinance. 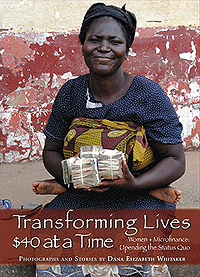 Transforming Lives $40 at a Time brings readers face-to-face and heart-to-heart with some of these courageous, devoted, resourceful microentrepreneurs from 13 countries on five continents who are using microfinance products and services, to provide a better life for themselves, their families and for entire communities. There is Ramatu, a poor, illiterate Ghanaian grandmother, whose income allows her to single-handedly raise her four grandchildren, pay off a mountainous debt, and even save $400 for retirement. And Theresa, a struggling Guatemalan weaver, whose income now provides an education for her children, a luxury her own parents were unable to give her. Theresa's ambitious eldest daughter Rosa has declared a previously unheard of goal, "I'm going to be a professional!" Also Hengbian, formerly a poor subsistence farmer in China, who has used her profits from her mushroom growing business to replace her straw and mud dwelling with a brick house equipped with running water, electricity and even a telephone to manage her profitable business and keep in contact with her son who, thanks to his mother, is now attending college. There is more. Access to microfinance is empowering women. They report having more self-confidence, increased decision-making power and greater influence in their communities. A Ghanaian microentrepreneur's comment captures this invaluable transformation, "Now I want for nothing. I have pride!" The photographs and stories in Transforming Lives are both a wake-up call about the billions of people still held in poverty's grip, and more importantly, a celebration of the success that is possible when we combine resources with resourcefulness to overcome the poverty of body, mind and spirit. "There are stories that need to be toldstories that put a human face on poverty, that acknowledge the rich dignity of the human spirit and that remind us that it is possible to make a difference in the world. This book, Transforming Lives $40 at a Time, contains stories that need to be told." "The power of microfinance helping very poor families rise above poverty with dignity is the great untold story of our time. Dana Whitaker's book gets the story out." "Economic development jargon and all the data pale in comparison with the compelling human stories Dana Whitaker has written. In this era of cynicism about American foreign aid and fear of terrorism, Americans need to hear this hopeful message." "It is rare that one is able to capture the hope and inspiration of the hard-working poor. But with her camera and her pen, Dana Whitaker has been able to do just that." "Buy this book and give copies to friends to lift their spirits. Dana Whitaker's stories and portraits of women finding their first taste of independence are awesome and inspiring." "Transforming Lives will inspire you with engaging stories of microborrowers in 13 countries who, to realize their dreams, launched businesses as diverse as selling pigs and sculpting peach pit toys. 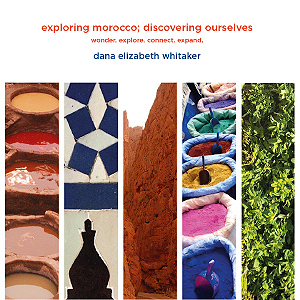 The book is illustrated with Dana Whitaker's fresh, colorful photographs, and packed with data, a reading list, and resources about microfinance. I promise it will excite you about getting involved." "I got your book and I am so incredibly moved. I just finished the last words of your Acknowledgments and I'm already getting a workout on my arms, because I have to hold the book up so that my tears don't warp its beautiful pages. Transforming Lives is extraordinary. Congratulations! I am glued to my chair until I finish reading it."